CLUB FOR GROWN-UPS. Disney has taken construction bids for the first 190 villas at Disney Vacation Club, the entertainment giant’s foray into the time-share business. The club isn’t taking the usual time-share approach, in which people purchase slices of a property, usually in weekly increments. The Disney project involves memberships. The villas will be built around the second and eighth holes of the Lake Buena Vista Golf Course. A builder is to be selected in the next few weeks. In 1991, Disney Vacation Development (DVD) named their timeshare program the “Disney Vacation Club”. The original DVC logo from 1991 contains three mountains, and was used until 1995 when the 2-mountain logo replaced it. In May of 1991, Disney filed their plans with local government agencies. 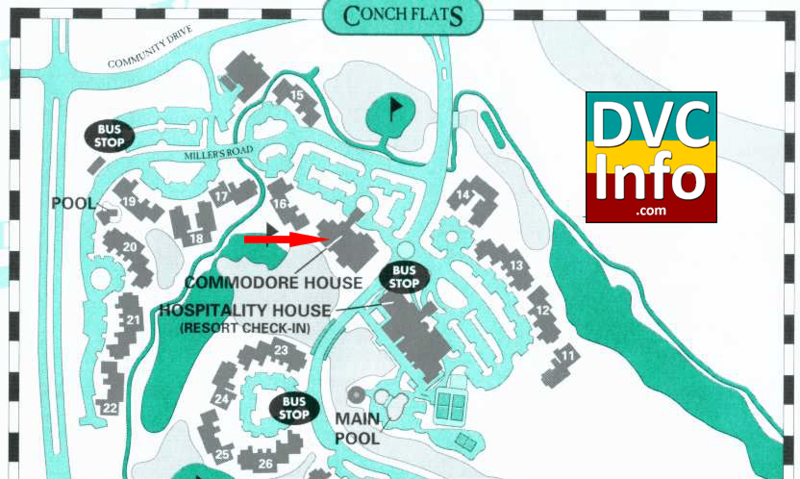 Below is Phase 1 of the Disney Vacation Club resort, later referred to as “Conch Flats” until it would receive it current name of “Old Key West” when the second DVC resort would open. Notice the “Sales Center” (to the right of building 16), which would be the first of three at Walt Disney World (the second one would be at Boardwalk and the third one at Saratoga Springs). Building 16 would be used as model rooms. Here is a more detailed view of the planned clubhouse and recreational area. Below are the plans for subsequent phases of the Disney Vacation Club resort. The DVC Preview Center opened up on Oct 7, 1991. It was renamed the Commodore House on Dec 20, 1991. The Commodore House was a welcome facility across from the Hospitality House and overlooking the pond next to the bridge. Guests could watch a movie presentation about DVC (the film finished with pixie dust spreading across the ceiling), enjoy refreshments and even a dish of ice cream after completing the tour. Commodore House had a wonderful covered porch that ran the entire length of the building looking over the golf pond. It had rocking chairs and was just an elegant setting (and very conducive to selling a luxury timeshare disguised as a Disney resort). The porch was accessible from the ground as well as from the interior of the center – so guests could stroll along the porch and enjoy the rocking chairs even during after-hours for the sales center. There was a very comfortable sitting area for guests and a screening room where the current sales video was shown throughout the day. Your DVC Guide would then walk with you next door to Building 16 to view the models. The building that was home to the first models was Building 16 – which still exists just as it did at that time. Three-story Building 16 has six lock-off 2BRs, two dedicated 2BRs and 2 GVs. One of the lock-offs was used as a model as well as one of the GVs. 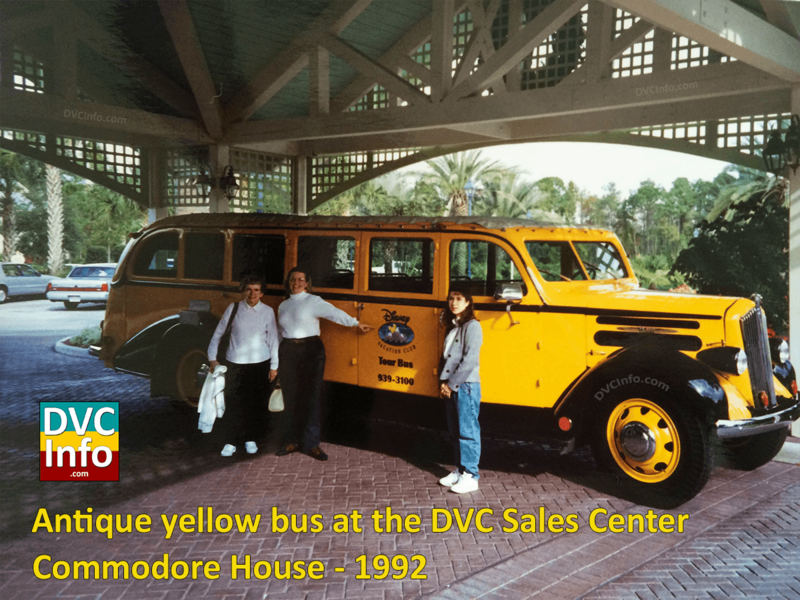 Here is a photo from 1992 of the antique yellow bus under the portico at the Commodore House at the Disney Vacation Club resort. This bus was used to transport guests to the sales center and return them to their resort afterwards. In July of 1998, the Commodore House was closed and demolished to complete the plans for the resort (buildings 62, 63 and 64 were constructed on the site of the Commodore House). 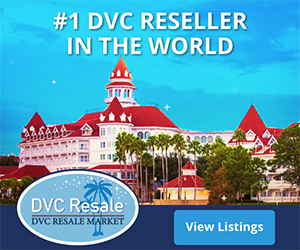 At this time the DVC Sales Center was moved to BWV where it remained until sales began for SSR in 2003. The sales center has been at the SSR location ever since. Memberships For The Disney Vacation Club Go On Sale Today – Starting At $11,730. Amid the hoopla of the 20th anniversary of Walt Disney World, the Walt Disney Co. is launching a spanking-new venture that puts a new twist on time-share ownership. Beginning today, Disney will sell memberships in the Disney Vacation Club, giving buyers the right to stays in Key West-style vacation homes overlooking the Lake Buena Vista golf course east of Epcot Center. The Disney Vacation Club works something like a country club – with a one-time purchase price and annual dues. Memberships in the Disney Vacation Club will start at $11,730 and will be good for 50 years. Owners will be assessed an annual fee of $500 to $700 as their share of property maintenance. Disney plans to offer financing for the initial membership fee. Owners will receive free admission to the Magic Kingdom, Epcot Center and the Disney-MGM Studio Tour until Dec. 31, 1999. Depending upon the type of membership they buy, Vacation Club owners will be allotted a certain number of ‘points.’ Each year, owners will decide how to use their points. For example, an owner could use his points to reserve a two-bedroom villa for a week’s stay during peak seasons, for a nine-day stay during a slow month such as September, or to reserve a villa for several weekend stays. Owners also can borrow points from the upcoming year, or bankroll points not used in the current year. Pacala anticipates the majority of buyers will pay from $11,730 to $15,500 to join. He said he believes the average purchase price will be $13,500, which will enable the buyer to spend one week a year in a two-bedroom villa during spring or summer. Three-bedroom, one-bedroom and studio units will also be available. The Vacation Club also has an arrangement with Resort Condominiums International of Indianapolis. That deal allows members to trade vacations for stays in 100 condominiums in Europe, Hawaii, Mexico and the Caribbean. Vacation Club owners’ reservations will be honored on a first-come, first-served basis. Fifty-one units will be available for occupancy starting in December and 146 additional units will open by next summer. 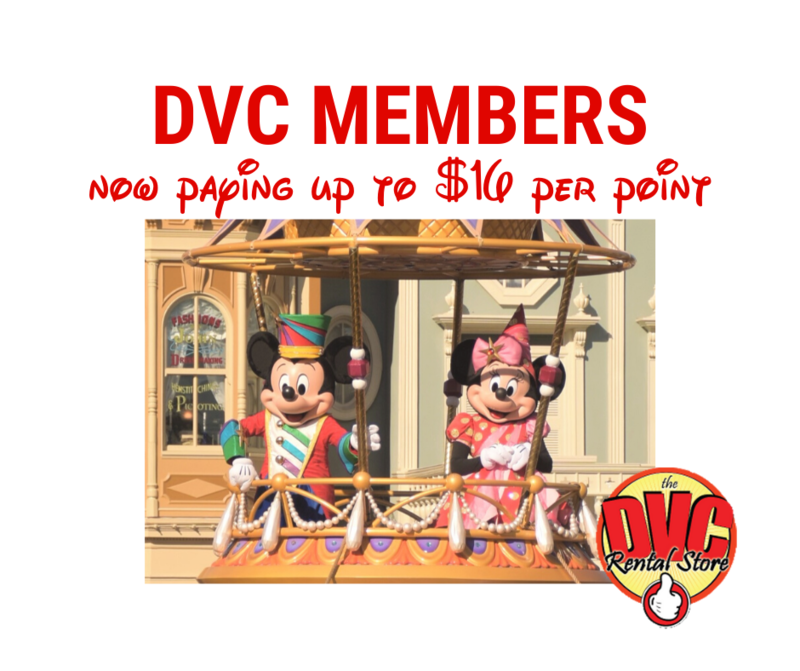 Sidebar: Did DVC invent the “points” system? No. The points-based timeshare system Disney used was not invented by them, but actually dates back to “the Father of Timeshare”, Dr. Guido Renggli. In 1963, Dr. Renggli and German developer Alexander Nette co-founded Hapimag, which started selling timeshares in Europe. Hapimag was the first timeshare operator in the world and is by far the largest in Europe. It was Dr. Renggli who first pioneered the points system. Vacation Internationale introduced the points system in the US in the mid-1970’s, beginning in Hawaii. Trendiest Resorts, based in the state of Washington, was the first timeshare company to only sell a points-based timeshare. Disney patterned its system on these models. Disney released the following press release, which ran verbatim in several newspapers of the day. 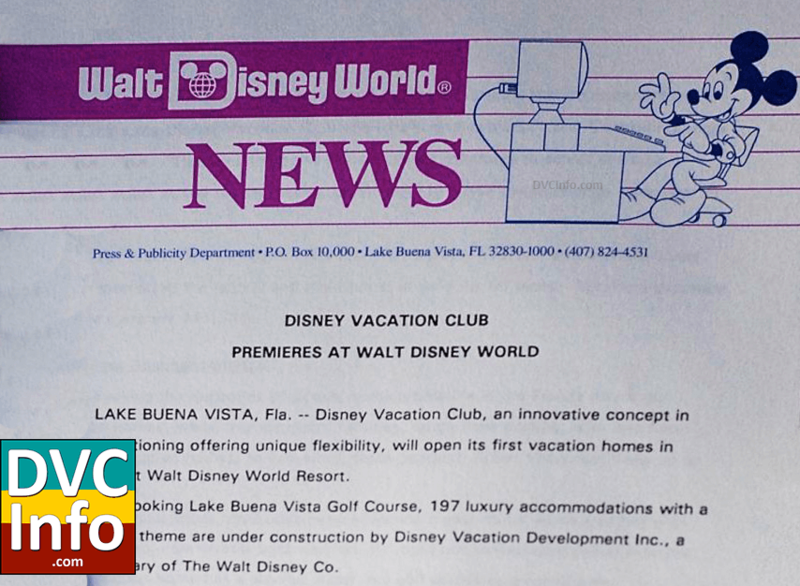 Photo of the new DVC Preview Center provided to the press which ran in newspapers. These are cast members in a staged photograph. On October 7, the DVC Preview Center opened and DVC started getting some press coverage. A few years ago, Mickey looked outside the gates of Walt Disney World and saw a booming business. Orlando had become the time-share resort capital of the world – an estimated $400 million annual industry in Central Florida. That success was largely because of the presence of Disney, but Mickey wasn’t getting a bite of it. To do so was tempting, but there was a downside for the company’s squeaky clean image. A bad smell lingered about the time-share cheese. The industry’s record had included charges of high-pressure sales tactics, fraudulent sweepstakes campaigns and build-’em and leave-’em developers. Yet other aspects of the business were tantalizing. The industry had steadily improved in the past five years, and it had attracted other high-profile corporations with reputations to uphold, such as Marriott Corp., Hilton Hotels Corp. and International Telephone & Telegraph Corp.
Disney decided to partake of the time-share feast, but not until it had developed what it believes is a new approach to the business. “We’re not a time-share resort,” said Mark L. Pacala, vice president and general manager of Disney Vacation Development Inc., operators of the Disney Vacation Club. “We’re a vacation club. We’re calling ourself something different. We are different. We want people to judge by our performance, not in reaction to the word time share.” The words “time share” never appear in any Disney sales brochures. Disney started selling the club this month. It is wrapping up construction of 197 units in a Key West-themed community on the Lake Buena Vista Golf Course. Of those, 51 units have been reserved for the vacation club, and the remainder will operate as a Disney resort hotel. Eventually, as many as 500 units will be built, and all may be converted to vacation club use. The venture is different from time shares in more than just its name. Disney had to tackle two key problems when it decided to move into the business – image and control. To achieve control, Disney has a different way of selling its space. Instead of selling a specific apartment for a week or two a year, Disney sells interest in the club that entitles buyers to a certain number of points. Buyers use the points to reserve different types of accommodations at different times for varying lengths of stay – all on a first-come, first-served basis. The membership is good for 50 years. For example, the minimum purchase of $11,730 would entitle the buyer to 230 vacation points ($51 per point). The buyer could use those points in various ways, including a three-week stay in a studio apartment during a slow season, a one-week stay in a two-bedroom apartment during a moderate season or a four-day stay in a three-bedroom apartment at a busy season like Christmas. Participation can be in almost any amount. Pacala said research indicates most purchases will be in the $11,730-to-$16,000 range. As many as 2,500 members might participate in the first 51 units, Pacala estimated. At the $11,730 minimum, that would be a sellout of almost $30 mil-lion. Pacala said the company never considered selling time-share property. The late Walt Disney bought 30,000 acres specifically so he could maintain total control, he said. Property owners might be tempted to try to stick their collective noses into the business of the Reedy Creek Improvement District, the governmental arm of Disney created by special legislative action in 1967. Disney in effect governs its 30,000 acres it-self. The vacation club is registered by the state as a condominium and falls under both state condominium and time-share sales laws. Condominium association members have votes, but Pacala sees no problem with that. The vacation club association will vote on such things as special assessments, budget increases of more than 15 percent and retaining the resort management, which is Disney. With the control factor resolved, Disney then tackled image. Marketing will be low-key, said Pacala, who was recruited from Marriott Corp., where he helped develop the Fairfield Inn economy motel concept. Information will be left for visitors at Disney World’s 9,000-plus hotel rooms. Two booths, one at the Magic Kingdom and one at Epcot Center, also will distribute information to those who ask for it. No gifts or other incentives will be offered for visitors to go to the Vacation Club Preview Center and hear the sales pitch. Buyers through the end of the decade, though, do get an incentive – free admission to the Disney theme parks during their vacation visits. State law requires a 15-day period when buyers can change their minds and get their money back. Disney will offer 30 days. The 1-to 1 1/2-hour sales presentation by “vacation guides” includes a movie and two video presentations. Participants have three opportunities to leave and catch a van back to their hotels or the parks. “If someone’s yawning or looking at their watch, the vacation guide asks if they want to go on,” Pacala said. If a visitor decides to buy, the salesperson leaves the visitor with a manager who makes sure the buyer understands the purchase and isn’t pressured. All visitors make two final stops – first at an old-fashioned ice cream parlor for ice cream and then at a wall mural for a photograph. The picture is sent to both buyers and non-buyers as a souvenir, along with a survey asking if any problems were encountered. Disney has hired salespeople with a minimum of five years’ experience. All went through three months of intensive training, not only in the vacation-club concept, but in the Disney culture. Ten percent to 20 percent have had experience in time-share sales. Pacala said compensation is based on commission and a base salary. Without spelling out the formula, Pacala said customers’ feedback on how they were handled will affect a salesperson’s earnings. Most salespeople are expected to get 60 percent to 80 percent of their earnings from the base salary, he said. Buyers can finance through their bank or Disney. Payment plans range from one to 10 years with initial interest rates ranging from 10.8 percent to 13.8 percent. The lowest rates are for buyers who agree to direct payment deductions from their checking accounts. Besides the purchase price, club members pay annual dues starting at $500. That charge covers use of Disney’s transportation as well as maintenance and real estate taxes. Pacala said the program is designed for people who consistently take vacations. “We want people to buy because they want to use it,” Pacala said. “It’s not an investment.” Even though the vacation-club structure is different from most time-share operations, it is firmly planted in the time-share culture. 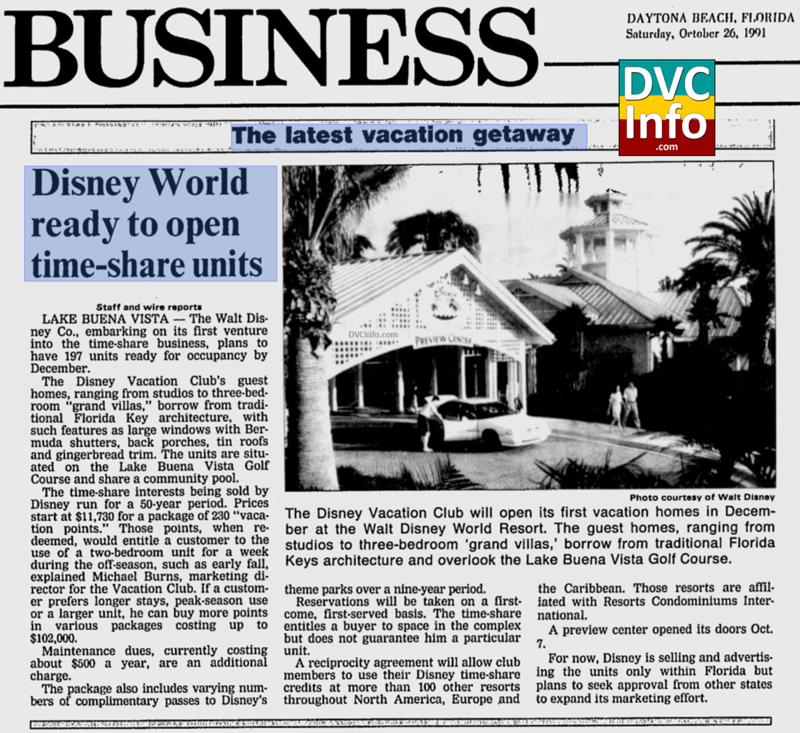 Notice the use of the photo from Disney’s press release in this Oct 26, 1991 article. If you happened to be one of the people who visited the DVC Sales Center at the Commodore House, you received one of these cool brochures. This is the earliest DVC marketing brochure I’ve seen, so let’s take a look at it. The brochure talks of all the amenities of the new Disney Vacation Club resort. DVC was marketed as a luxury accommodation. Disney really didn’t know if their vacation club was going to be a success or not, so early on they offered a pretty good incentive to purchasers – free park passes! This was unchanged until a reallocation took place in 1996, followed by additional reallocations in 2010 and 2011. What’s interesting is to compare this points chart against those from newer resorts such as BLT, VGF and PVB – and you’ll see point inflation has taken place. On December 20, 1991, the resort officially opened to members staying on points. The resort had actually opened on October 1, 1991.